You are here: Home / Diary / Sticky Paws Quickie Giveaway! This package showed up unannounced on my doorstep, and even though it was addressed to my human, I knew it was really for me. It was a big box of things from the humans at Sticky Paws. They are celebrating their fifteenth anniversary and I could not believe how much was in there. There was more Sticky Paws stuff than you could possibly imagine! There was also a Healthy Paws Electric Pet Massager. Actually the only one who really liked that was the dog. Plus a novel — The Cat Master, personally autographed by the author, Bonnie Pemberton, who is also the CEO of Sticky Paws. My human is already a quarter of the way through the book, which she says is really good! The main characters are kitties. But here was the best part: a Scratch-n-Relax sisal mat and a Scratch This! cardboard cat scratcher. You-know-who couldn’t wait to get her paws on them. But nobody was touching anything until I examined it thoroughly and gave my approval. Which brings me to the giveaway! My human said we had enough cardboard-type scratchers in the house and we really did not need another one. I had to admit she was right… so we are giving away the Scratch This! scratcher. Since this is a last-minute contest, I am going to make it totally easy — all you have to do is leave a comment below saying that you want it. I will pick a winner using random.org. Only comments left before 11:59 PM Pacific Time tonight (Friday, November 12, 2010) will count. That’s it! Good luck! But just to let you know… we are keeping the box. The human says I look weird while using logs as scratchers, so I want one! What a haul you received! I think Mom wants to blog jog too. My goodness Sparkle what a lot of stuff ! sell it on Ebay when you don’t need it, you are too generous, lol ! In the first picture you look like a little fox ! My kitties totally destroyed the cardboard scratcher while we were on vacation! Came home to a big pile of cardboard dust! They would love this, and if they’re happy . . . I have 3 cats that would love this. They are fans of yours and your adventures. They love their scratchers. Benee, Lokee, and Bevee say hello. What a great package! Mom says we don’t need another scratcher right now so we have to let another kitty win! I don’t need more scratchers, but this was really a fun post! You are so photogenic! My Human bought some sticky-paws strips when I was just a youngster, but I didn’t really stop clawing the furniture till she bought me my nice tower and a bunch of other scratchy-things. And, shhhh, you know, I still scratch on the box springs some, but really only because the Kitties Who Came Before started it. Can I come over soon and get up close and personal with some Sparkle-toes? Yep, add us please to the contest we want to win it! 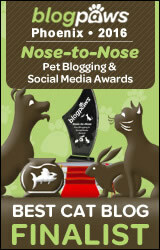 Thanks, Love, Buddy, Lola, & Tigger- PS We love your blog Sparkle; We may even need to ask for some advice here shortly. How do we do that? Want! Love that company! And love those scratchers for the foster kitties. Sparkle, we would love to be in the draw, SomeCat yakked on our last cardboard scratcher and it sorta dissolved. I have four indoor kitties who simply LOVE those cardboard scratchers. Haven’t had any in a while since we’ve had to carefully watch the money, so I definitely want my name in the drawing. And a big scratch between the ears for doing this giveaway. That’s very generous of you. Wow Sparkle,that’s really generous of you and your human. Mongkut says he’d really love to have one since he doesn’t have any and his mom doesn’t like it when he scratches her leather chair. We got tons of scratchers too, but that is a great give-away! Oh, the Farm cats would love that. They used up their last one. How exciting to find all that on your doorstep! Sadie wants a massager now, Mommy is going to check out that book (if there are any sad parts involving cats where she’ll get really leaky she can’t read it), and we’d love a new scratcher! All of our scratchers are so old they don’t hardly work anymore. Thanks for a chance to win a brand new one Sparkle! OH what an exciting gift! With all of us, we can always use a new scratcher so count us in. Great box of loot guys! one can never have too many scratchers! My kitties could definitely use that! I haven’t quite convinced them that the sisal area rug is NOT the biggest scratching post in the world! Uh-oh, sisal is a favorite kitty scratching surface! My human tries to buy rugs and furniture with fabric that does not appeal to us cats mdash; stuff that our claws can’t get a good hold on. When she does not do that we “go to town,” as she says. Lucy thinks she is a secret carpet scratcher but mum and I know it’s her cos we’ve caught her red pawed!! We would love to be entered into the draw but understand if you don’t cos we’re in the UK. The contest is open to everyone! Please don’t enter us in the draw, though, because we DO have enough scratchers! wow! That is so cool! I’ve never had a cardboard scratcher, so please enter me in the contest! We’d love to win this! Please add our names to the giveaway!! Sparkle, we don’t blame you for keeping the box! It’s very cool of you to give away the scratcher, we’d love to have a chance to win. Our mom puts that sticky paw stuff on the furniture where she doesn’t want us to scratch…it works! you got A LOT of great stuff! This is a cool scratcher and Miles has a scratching problem. We have almost enough scratchers around the house but if we won this one that might be helpful. Who evercat wins it, will enjoy it though because it came from you, that is great! bonks for a super fun day and good luck with the contest. Count us in! Black would love another scratcher. He has just about finished off the one we have. He likes the cardboard ones better than the sisal rope ones. So we would very much like to be in the drawing. Thanks so much for doing this. That is a lot of good stuff you got from Sticky paws. Hope all of you have a fantastic week end. 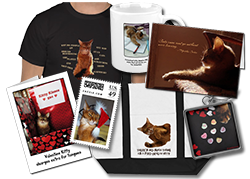 We has lots of scratchers, but I wanted to tell you that it is very cool that you are giving one away! Cassie says she would love another scratcher, so she’s in too! Our mom says we don’t have enough scratchers around the house!! So count us in for the drawing! That’s really nice of you to give away the scratcher. Since I don’t have front claws, I don’t need it, but thought I would post a comment anyway.